Malta’s armed forces have taken control of a tanker which had been seized by migrants off the coast of Libya on Wednesday. The tanker, Elhiblu 1, is now heading to a Maltese port with the crew and migrants, who will be handed over to police. 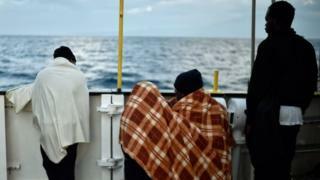 More than 100 migrants who had been rescued by the ship hijacked it after being told they would return to Libya. They had ordered the ship’s captain to head north towards Europe. In a statement, the Armed Forces of Malta (AFM) said they had established communications with the captain of the ship when it was still proceeding towards Malta. The captain said he was not in control of the vessel and that he and his crew were being forced and threatened by a number of migrants to proceed to Malta. Italy’s interior minister, Matteo Salvini, had earlier called the migrants “pirates” and said they would not be allowed to dock in Italy. He described the act as “the first piracy on the high seas with migrants”, according to the Associated Press news agency. The incident comes as the EU says it is ending navy patrols in the Mediterranean. He has been at the centre of a number of international row over his refusal to allow migrant ships dock in Italian ports.